As we finish with 2008 and look toward 2009, I wanted to say a big thanks to all of you who have been faithful readers, supporters and encouragers. It has truly been an amazing year and to even attempt to list the top few experiences would be futile. So let me end this year with one last question. What will you do differently in 2009? What are some things you will stop doing and start doing? What relationships do you need to end, mend, or begin? What will you do to make 2009 way better than 2008, even if 2008 was not that bad for you? I pray that each of us will seek God's direction and set lofty goals that can only be accomplished with His help. BTW...the name of the blog is changing for 2009. "Did the innkeeper get any recognition?" Just the latest in a long line of questions from my children. This one from my daughter. Here's the conversation. Like, did Mary and Joseph tell him thanks for letting them stay with the animals? I don't know. The Bible doesn't really say. What do you think? I think he should have gotten some recognition. I think they should have said thanks. I think you are right. I bet they did, don't you? Why do you think they should have said thanks? Because that's the polite thing to do. That would have been nice. So What? Be sure to give "recognition" to the people in your life who have blessed you this year. Even if it wasn't what you expected, every one loves a little recognition. Especially for the cool Christmas gifts you received. Isn't funny how much our kids can teach us? I played a new game this weekend. It's called "Last Word." The object of the game is to be the last person to say something relating to the designated topic and starting with the designated letter before the timer goes off. I played with my family and we had a blast. 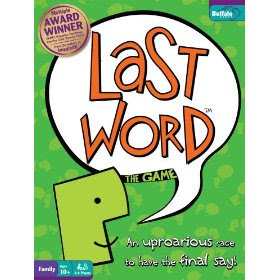 Are you a Last Word Person (LWP)? You know, the person who always has to say the last thing in any conversation whether you know what you are talking about or not. Or maybe you will be around a LWP during the holidays and you are REALLY excited about that. Usually people who want to get the last word in are starving for attention and a bit insecure. Sometimes they are incredibly negative too. Those are the ones that I have trouble with. LWP's are always trying to "one up" everyone else too. They want their story or gift or experience to be so much better than everyone else's. Most of the time the LWP tends to make your time together much less than joyful. So What? Maybe the best thing you can do this holiday season is just shut your pie hole. If the LWP wants the last word, let them. No need to argue or stir things up. If you are the LWP, don't be. Instead, enjoy the conversation and stories of others and don't seek attention for yourself. Remember, this time of year should be a time of joy and thankfulness. Don't blow it by always wanting the last word. "You know what I like about church? When I walk down the hall people say good morning to me and call me by my name." We all like to feel like we are a part of something. We all like to be known. We all want to be recognized and missed. That's why we try to make sure that we speak to people and introduce ourselves to people on Sunday morning. I met three new families yesterday. One of them has been coming for a couple of weeks but I had not met them so I introduced myself. It's a bit awkward sometimes because I feel like I should already know people, especially if they have attended our church before. But I don't meet everyone and I forget names too. So I just apologize and introduce myself. Most people are very understanding. No one has acted very offended so far. But I want to do better at calling people by name when I see them. So What? If a nine year old feels that great about being called by name, I think everyone will feel the same way. Work hard this week at calling people by name. It lets them know that you care enough to know their name, recognize them as a person, and it will make them feel loved and needed. I guess it's OK that he likes that more than what he likes what the preacher says. I'll get over it. It looks like a Peppermint Fantasy Land! That was the reaction when the doors opened to Chocolate Heaven last night. More than 200 women showed up for the inaugural event of our Women's Ministry, Uptowne Girls. The decorations were amazing, The chocolate was spectacular (chocolate dipped Ruffles potato chips?). And Genni Owens!? Wow! She is amazing. 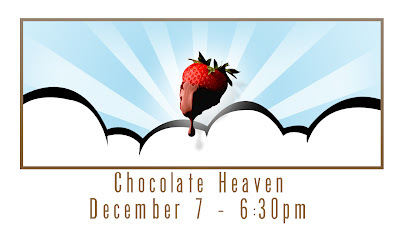 It was so cool to see all those women gather in the name of chocolate and, more importantly, God. To know that they were all joined by a common spiritual bond was an amazing thing. Seeing them enjoying each others company, the food, and the concert by Ginny, well it made me want to be a woman (not really, but you know what I mean). So what? Isn't it obvious? Doing things with friends and being willing to identify with God at the same time is a very cool thing to do. It's not a girly thing either. It's something that we all need to work toward. So the Women's Ministry, Uptowne Girls, is off to a great start. I am looking forward to how God is going to use this group to impact our church, our community, and the world with His love. I had a great conversation yesterday with some people after church. We were standing there in the entrance to the Worship Center near the Angel Tree table and they mentioned that all of the Angels had been adopted. Angel Tree is a ministry of Prison Fellowship where children of inmates receive Christmas gifts. Obviously, if a parent is incarcerated they cannot go Christmas shopping. So Prison Fellowship developed this program. Inmates enroll in the program, make a list of gifts for their kids, get that list to PF and them local organizations "adopt" the kids, Angels, and purchase those gifts in the name of the child's mother or father and then deliver the gifts to the kids before Christmas. It is an awesome opportunity to minister to these families and it takes a lot of work on the front end. The organization, in this case Midtowne Church, must contact the care giver of the kids and make sure where they live, make sure the sizes are accurate for clothing, etc. Then the angels have to be adopted. I was impressed when out Angel Tree Coordinator told me that she thought we should adopt more than 150 Angels. She told me that she thought we could do it. I have to admit that, once again, I was not real sure our church could do it. After all, we are a new church and have a bunch of very young Christians and a lot of "un-churched" and "de-churched" people here. So back to the conversation with the people after church yesterday. When they told me all the Angles had been adopted, I got very excited. This was only the second Sunday that we made them available and now all of them were gone! I told the people to whom I was talking how proud I was of the people at Midtowne and their heart for ministry. It is very humbling to be a part of something like this. The people here are really catching on to this idea of ministry and just what it means to show God's love. So What? Don't ever forget why we are here. It's not about a person, or an organzation. It's all about helping others find and experience God's Best. What will you do to show God's love to someone? How can you get in on God's Best for your life by sharing God's Best with someone else? Midtowne People, I am proud of you and humbled to be a part of this thing called "church" with you.